The present Church was built by John de Grey in 1310, following the erection of Ruthin Castle by his father, Reginald de Grey in 1277. 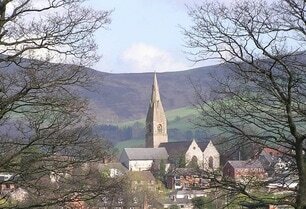 For some time before this Ruthin had been the home of a nunnery and a prior. From 1310 to 1536 St Peter's was a Collegiate Church served by a Warden and seven priests.
. A close relationship is maintained between the Church, Ruthin School and the Almshouses of Christ's Hospital. St Peter's has gained an admirable reputation for the high standard of its church music and choir. The organ was rebuilt in 2002 at a cost of over £100,000.